Winter Sports Hotline: 440-256-2118 x4178 or follow us on Twitter @lakemetroparks. Getting there: Rt. 306 Entrance: Take I-90 to Rt. 306 south for about 3 miles to the park entrance located on the right (west) side of the road. What's there: 7.5 miles of terrain that will challenge every ability from Novice to Intermediate. The ski center is opened and staffed when weather, snow accumulation, and conditions warrant opening (four inches of snow needed to ski on). The Pine Lodge Ski Center at Chapin Forest features a cross-country ski center complete with ski rental equipment and lessons, groomed ski trails, snowshoe rentals, fireplace, accessible restrooms and concessions. 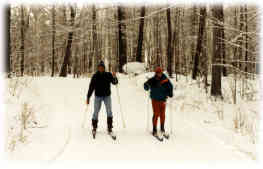 Pine Lodge Ski Center is open during the winter months, weather-permitting, from approximately November 15 to March 15. Before visiting the center, call the Winter Sports Hotline for daily ski conditions and snow accumulation reports and to confirm the center is open for the day at (440) 954 4178.